There is almost nothing in life so sweet as pure maple sugar — that is, if we’re speaking literally. Did you know that our home of Northeast Ohio has rich glacier deposits from the Ice Age, giving it the perfect growing conditions for the sugar maple tree? No wonder we hear so much about maple sugaring this time of year. If you’ve never seen the process in person, bring the family out this spring to one of the many regional opportunities. Sap collection methods have evolved over the years, but the way trees produce the sweet stuff, and the way it’s boiled, are as traditional as can be. Judy Bradt-Barnhart, a naturalist at Geauga Park District, explains the reason sap drips out of the tree in the first place. As winter changes to spring, with its freezing nights and warmer days, pressure builds within the trees. Remarkably, the sap we hear drip-drip-dripping into buckets hanging from spiles on area trees is only about 2 percent sugar to start. But the tasty end result is anywhere from 66 to 67 percent sugar. How do they do it? By evaporating off the water. Barnhart explains that once sap is collected and transported to the sugarhouse, it is put into a float box, which determines the level of sap that can be put into the evaporator — not too much so that it won’t cook, but not too little so that it will burn. What boils away, excess water, evaporates and leaves the sugar house through a hole in the roof — the peak on a sugarhouse that lets you know for sure what it is. Syrup is ready when it reaches 219 degrees, or 7 degrees above the boiling point of water, and is tested with a hydrometer to ensure that it isn’t too watery or thick. Then it is drawn into a tank, pumped through a filter, and then pumped into a canner. Perhaps the next step, bottling, leads right to your kitchen table. So come March, shake off cabin fever and head to one of the many area sugar houses. You may never shop for maple syrup the same way again. Submitted by Geauga Park District. The district’s Sap’s-a-Risin’! celebration happens this year March 5 and 12 from noon to 4 p.m. at Swine Creek Reservation in Middlefield. 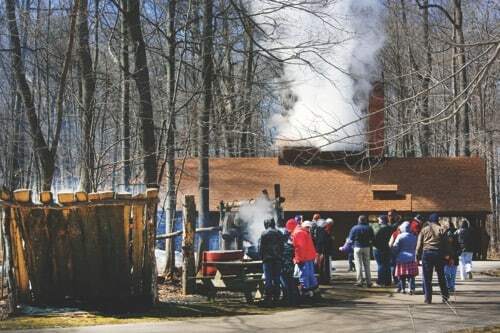 Free festivities include gathering sap in the sugar bush with the help of a horse-drawn sap sled, sugar house tours, samples of the sweet stuff, live string band music and maple treats in the lodge. Click here for a complete listing of maple events in Northeast Ohio.